Tell me you love hills. You do don’t you. Because if you are ever going to run the Beachy Head Marathon you are going to have to get used to them. Beachy Head Marathon 2015 was my second attempt at conquering the South Downs and the Seven Sisters. Last year I bonked, badly. I have one excuse. I was in between changing my nutrition regime from one of predominantly carbohydrates to one of massively reduced carbs and increased fat and protein. By the Brecon Beacons Ultra in Novemer 2014 I was fine. But the Beachy Head Marathon 2014 came just a few weeks too early. It may be that I was also not fit enough in general. I had also bonked at the Lisbon Marathon a couple of weeks before. 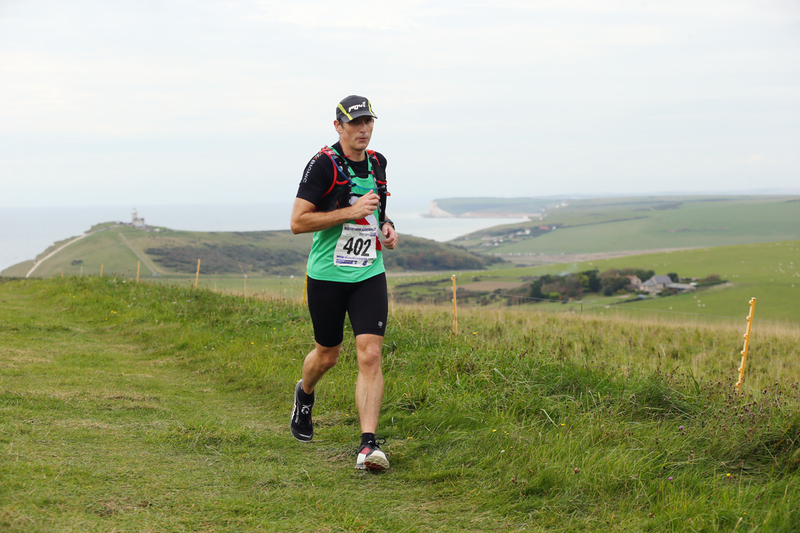 So, I had one goal coming in to the 2015 Beachy Head Marathon; beat last years poor effort. I am fairly strong at the moment having knocked out a few marathons and ultra distances in recent weeks. I was quite confident that I could beat 4 hours 55 minutes and ideally I was hoping to come in around 4:30. The route is fantastic. It’s one view after another. 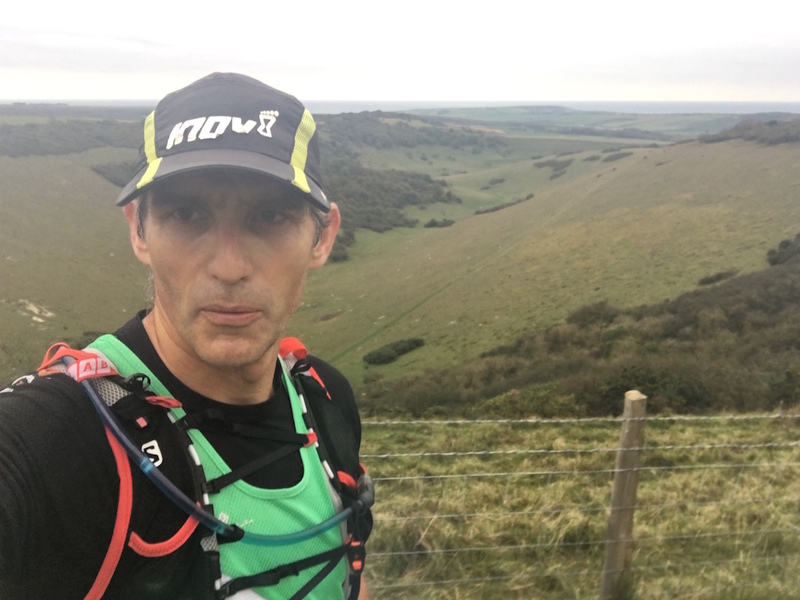 There is a short 3 mile section in the middle which is a little monotonous but it’s also flat, so it’s possible to bang out a few quick, evenly paced kilometres without stopping to climb or look at views. But that really is the only continuous section of flat running. The rest of the run is either up or down from the very beginning. Last year I travelled to Eastbourne with Grant, Mark and Richard. 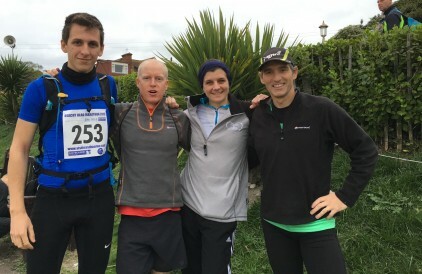 This year Grant and Mark are struggling with extra and changing life responsibilities so it was left to Richard and me along with new Worthing Harrier Tom, to fly the green flag (wear the green vest?). 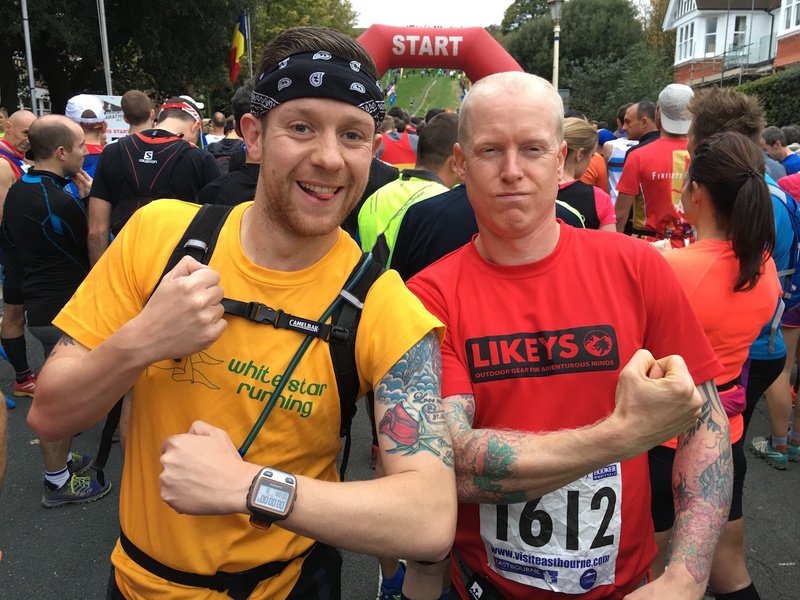 However, during the course of our adventures this past year, Richard and I have met a good few other runners. 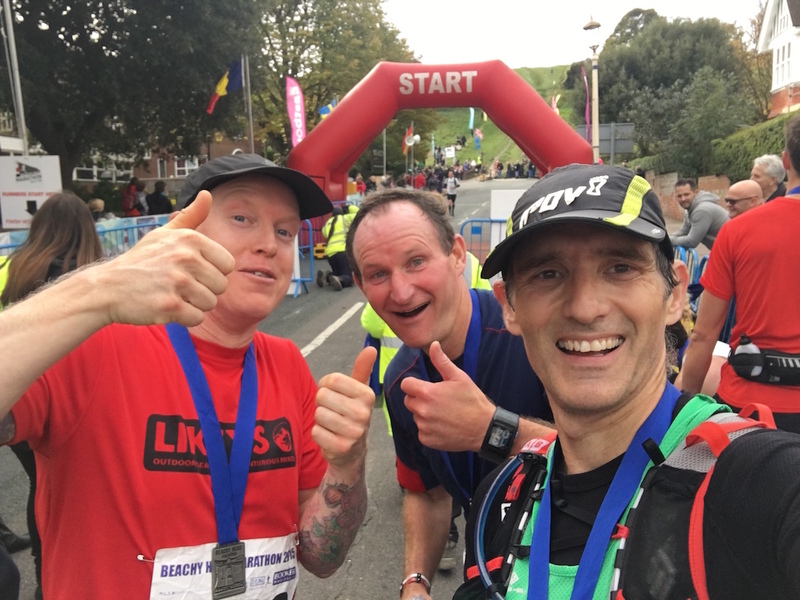 Indeed from the moment we arrived at Bede School for race registration we were bumping into friends and acquaintances and saying hi to race regulars and people we vaguely recognised. 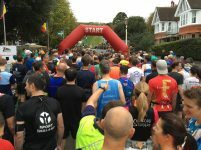 Last years race was also the day I took a step up in the production quality of my running films. Other than the Paris Marathon films, which always seem to attract thousands of views, the 2014 Beachy Head Marathon video was the first to reach a wider audience. You would have expected therefore that I would want to film this year’s event. But you’d be wrong. Sometimes the running is more important. This year I was exorcising a ghost and filming was only going to hinder the attempt. There’s an old adage in running: Don’t go off too fast. In no other marathon is this more appropriate, given that the start is up a steep hill for half a mile. If you sprint off and you’re not an elite athlete, you really do run the risk of crashing a burning before you’ve even got going. I made this mistake (amongst others) last year in trying to follow Richard up the hill. Another reason why it all went Pete Tong 12 months ago. When the hooter sounded Richard did his usual trick and was gone in seconds. Tom and I stayed together and took our time climbing out of Eastbourne. If you turn around and look back you have a foretaste of the view to come at the end of the race. Rather than heading directly up and on towards Beachy Head itself, the course takes a right and heads inland over Eastbourne Downs golf course and out to the village of Jevington. For the first half marathon Tom and I stuck together. Through Alfriston village and out the other side, over the hills to the checkpoint at 12 miles. 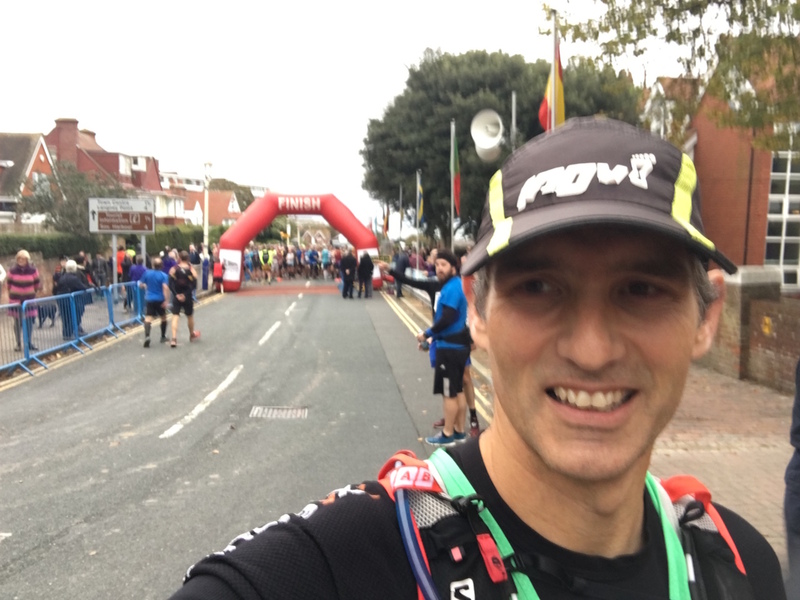 I was somewhat surprised that having taken it relatively easy in the first half, we arrived at half way in around the same time as I did the year before. Then comes the long, flat section heading back to the coast. Towards the end of this bit I could see Tom beginning to tire. Had I not been out for revenge on this dastardly marathon, I might have stayed with him and helped him along. 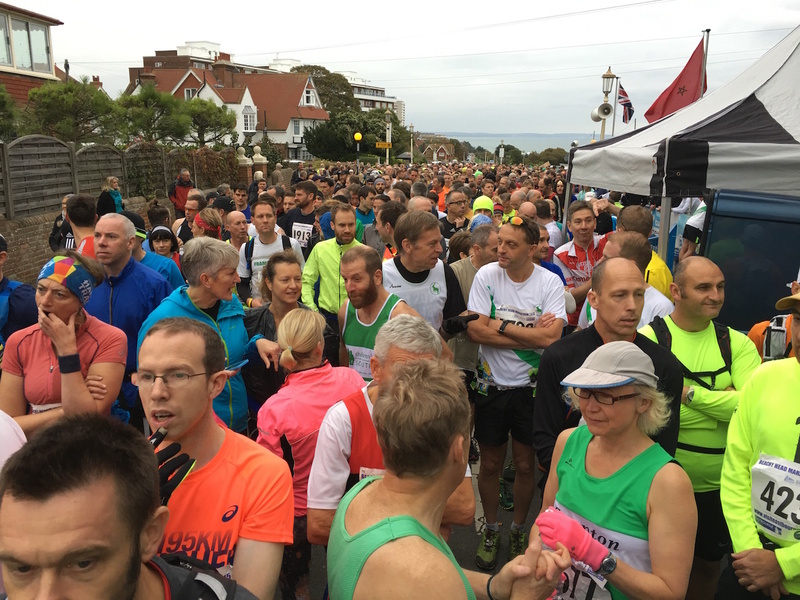 But this is the Beachy Head Marathon and I am not here for fun or charity. There’s work to do. I felt good and pushed on. To be fair Tom hung on in there and when I reached the aid station at mile 17 he was still only a few hundred yards behind. However there was no sign of Richard up ahead. I remember reaching mile 20 in 2014 and feeling I simply couldn’t run any more. There is a big climb out of Exceat at the mouth of the Cuckmere River and I pretty much walked the entire thing last year which took half an hour. This year, I ran the whole thing. I love that feeling in a marathon where you are overtaking loads of runners in the second half of the race. 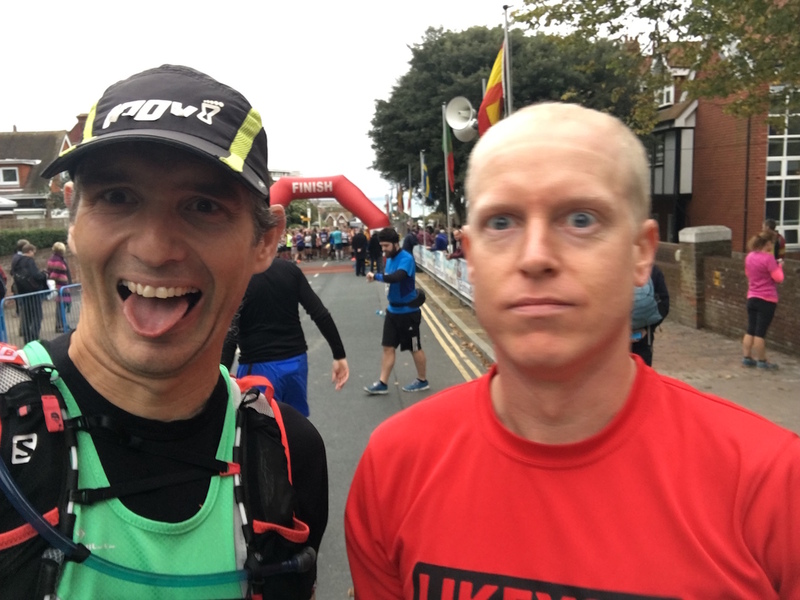 This year was particularly special because early in the race I was talking to Tom about the importance of not going off too fast as I was overtaken by a youngish lad who said, ‘so I’ll expect to see you cone storming past me at 20 miles then’. Well I think it was around 22 miles when I saw self same chap up ahead climbing one of the Seven Sisters. I approached and passed close by, just to make sure he saw me!! I didn’t say anything of course. No need. There’s no denying I was tired. 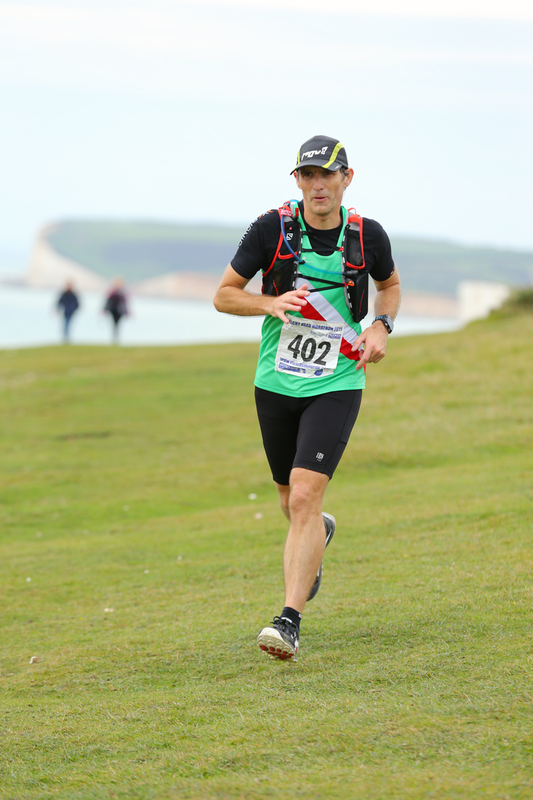 There’s no getting away from the fact that the Beachy Head Marathon is a tough marathon. But today was a good day. Today I had the legs for it. For the entire race I had one goal in mind; to beat last year’s time. Once I was happy at 20 miles I knew I could push on. 4:30?? 4:15 perhaps? By the aid station at Birling Gap which is 22 miles, I thought I might actually be in with a shot of sub 4 hours. I was quite tired by now but I thought I should give it a go. I got to mile 24 and checked my watch and made a fatal mistake. I decided I wasn’t going to make 4 hours after all. So I gave up trying and just carried on at a comfortable pace. It wasn’t until I crowned the hill and saw Eastbourne below that I realised how close I was. I sprinted down the hill and crossed the line in just over 4 hours and 1 minute! If only I hadn’t stopped so long at the aid stations. If only I hadn’t stopped for a wee. If only I’d tried just that little bit harder, I would have made it. But you know what, I am delighted with my time. I hadn’t been trying for sub 4 for 90% of the run and I to come in only a minute over 4 hours is pretty special. Furthermore, when I crossed the line who should be there but Richard. He was only a minute in front of me finishing dead on 4 hours. If I had seen him ahead on the course I might have made an bigger effort to catch him. I don’t know why I didn’t spot him before. Back for more next year? Tom came in just 15 minutes after me in a very respectable 4:16. Fantastic for a first trail marathon. If I had brought my swimming attire I may well have taken advantage of the Bede School swimming pool which was apparently available for our use after the race. I made do with a warm shower instead before heading to the pub with Richard for a celebratory Coke. We may well be back next year, or not. We have yet to decide. Richard has nothing to prove having done 3:55 last year and I am really pleased with my result this year. But who knows where we’ll be in 12 months. Right now I have the Stort 30 to think about. 30 flat miles the day after a hilly trail marathon. Should be hilarious.